We arrived in NYC yesterday and are already having the best time! I'd love to see you over on Instagram for some peeks at what we're up to. Today I'm thrilled to have Rhoda from Southern Hospitality here to share her Favorite 5 with you. I finally met Rhoda in person last month, and what you see is what you get! She is the kindest, most down to earth, encouraging person and I'm privileged to call her my friend. I've been following Rhoda for 7-8 years probably, and am always inspired by her projects, her journey, and her wisdom as a seasoned blogger. She has had some challenges as well as triumphs in her life, and she has weathered it all with courage and grace and heart. Enjoy getting to know Rhoda today! I'm so happy to be here with Jennifer today! I've been a big fan of Jennifer's style (and her heart) ever since I found her blog several years ago. In case you don't know me, let me tell you a little about me. I've been blogging at Southern Hospitality for almost 10 years now (yep, I'm a pioneer in this blogging niche) and still love talking about decorating and house stuff. It's just in my blood. I love seeing a house transformed into something beautiful. In fact, my own house has gone through a major transformation in the last 4 years. I'm a single lady, for now anyway, and 4 years ago bought my fixer-upper 1979 home that was in dire need of updating. It had never been touched. My 85 (at the time) year old dad helped me bring this house up to the 21st century with lots of paint, sweat, and elbow grease. It's been a very fun journey watching this ugly duckling house turn into a beautiful swan. She has come a long way, baby! So, I'm very excited to share with you my favorite 5 rooms and projects at my home. Keep in mind, my home is not big and fancy, but I've made it over to its fullest capacity with a lot of paint, DIY projects, and hard work! So, if you happen to have a fixer upper house, you may get some ideas from my house journey. Probably my first favorite transformation is my kitchen. I was definitely on a budget redoing this kitchen and I didn't have unlimited resources to spend, so I went with Ikea cabinets in here and still love them to this day. I'd do it all over again if I was doing another kitchen with a tight budget. 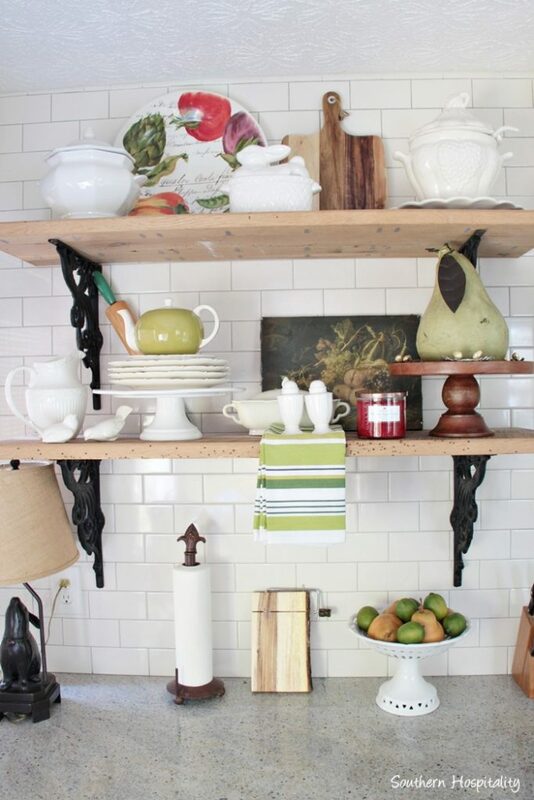 These rustic shelves are a fave of mine in the kitchen and you can see all the Before and After pics on that link above. My latest project just completed this summer is the gutting of my master bath. From one of those dated one piece tubs to a fully tiled shower, it's a dream bath for me now. Even though it's small, I feel like I'm on vacation now, in a fancy bathroom! 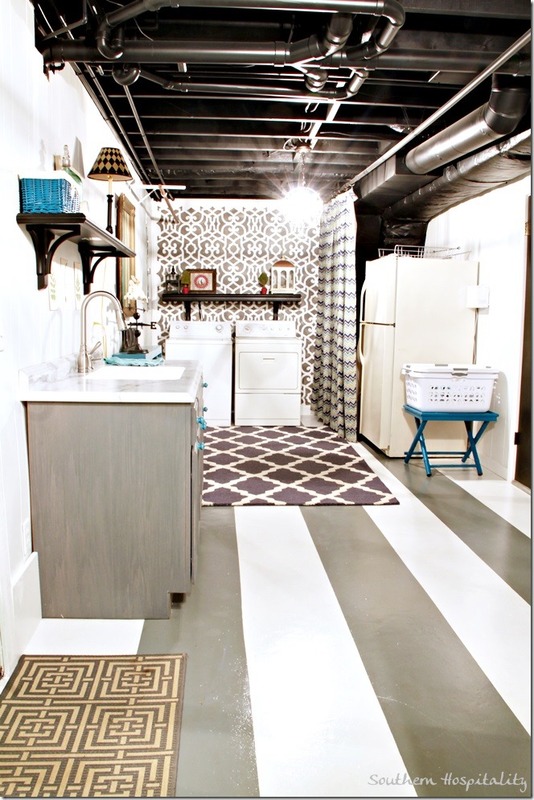 One of the biggest transformations in my house was this dark and dank laundry room/mudroom space. On a concrete slab, it was the dreariest room in my house. I couldn't imagine doing laundry in here, but once we finished with it, it's one of my favorite renovations ever! And most of this was done with paint! I painted the concrete floor with porch and floor paint in gray and white stripes and it looks and feels wonderful now. That link has all the horrid before and the pretty after pics! 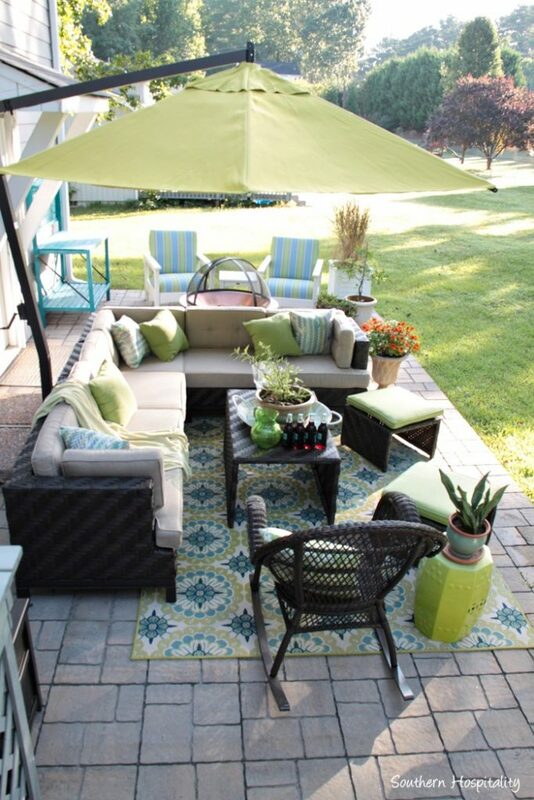 My outdoor spaces are two fold for my #4 pick! 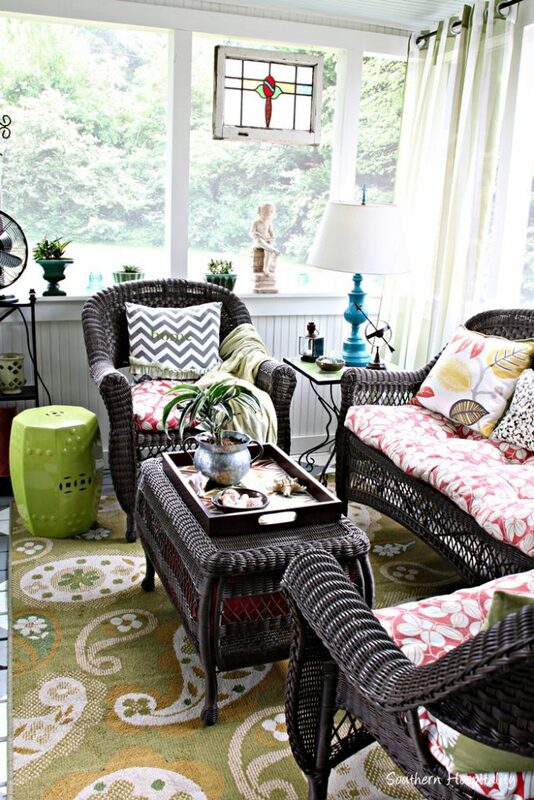 A screened porch has always been on my wish list and I have one in this house. It was a wreck when I moved in here, but we fixed it up as good as new and it's where I spend a ton of time in the summer. Right outside, the newly finished patio space is extra special too! And rounding out #5, one of my favorite projects we've done in my house is building in these Ikea Billy bookcases. It made such a difference in my den space and added so much architectural appeal. I have several posts on how we finished these off to make them look built in. So, that's a wrap on my favorite spaces and projects at my house! 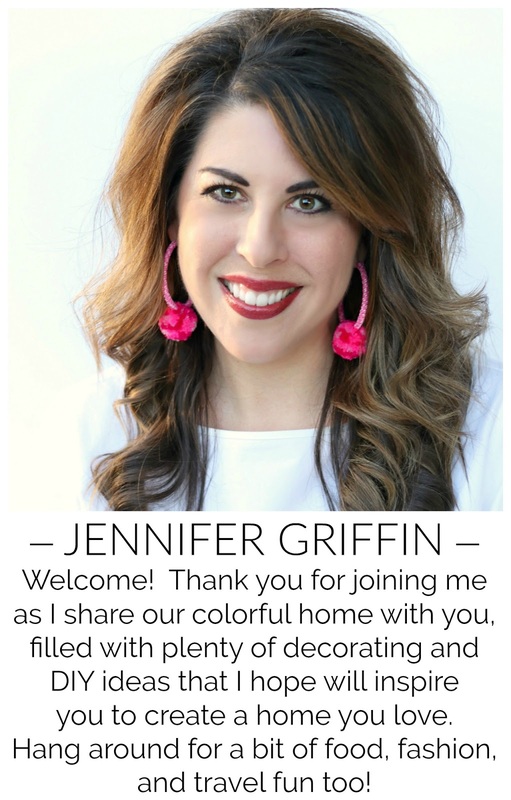 Thanks again, Jennifer, for having me over today, it's been a joy to guest post for you and I hope you'll all come over and visit me at Southern Hospitality! I talk about everything from decorating, DIY projects, recipes, fashion over 50, travel, and more. I believe in enjoying life to the fullest and being grateful for everything I have. God has blessed me so much and I love sharing that hope with others! 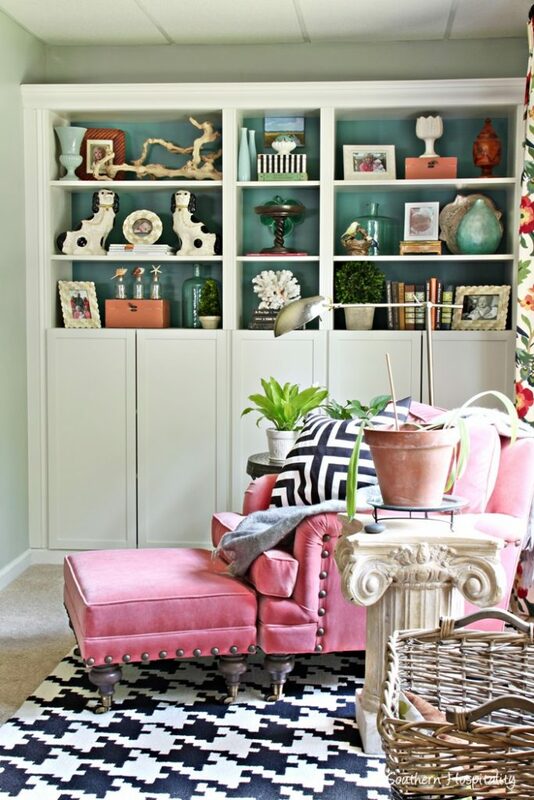 Oh my goodness, if I could just snap my fingers and transport that little corner with the pink chair to my house, I would do it in a heartbeat! Thank you, Rhoda, for being here today! Be sure to hop over and say hi to Rhoda at Southern Hospitality, and check out more of her fantastic DIY projects! Don't forget to check out the Blogger Stylin' Home Tours going on this week, I'll see you here tomorrow with part 2 of my tour! oooh rhoda's bathroom is similar to what i want to eventually do in ours. 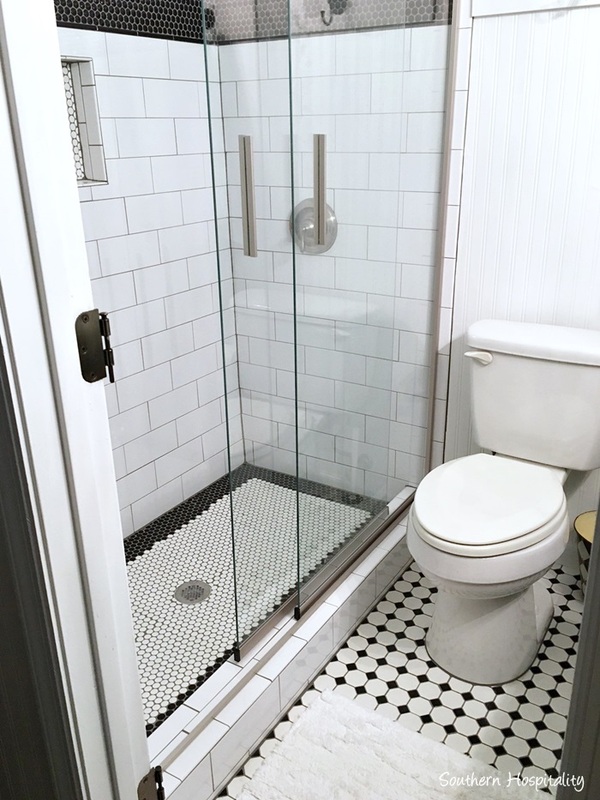 it's a small space with a dated tub, too! I follow both of you and I love the friendship you have formed. It shows! I love Rhoda's blog and I especially love her Mom and Dad but I seldom read it anymore because I have an ad blocker on my computer and her blog now comes up as a very, very VERY narrow column and it truthfully hurts my eyes to read it. It is a shame. Rhoda has been one of my favorites since before I started blogging years ago! Her stair makeovers inspiring my own along with many other gorgeous projects she gave me the confidence to try! 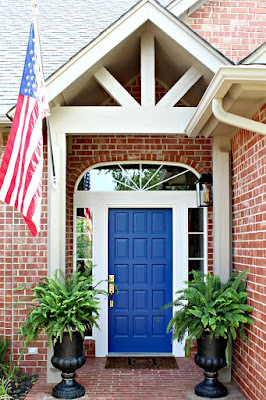 Such a beautiful home and one of the kindest bloggers out there! I love all you posts! Such great colors. Can you share some information on how you painted your gumball machine? I recently acquired one from a flea and yours looks stunning. Hi Domonique! I took apart everything that I could and just sprayed the metal parts. If there was something that I couldn't take apart but didn't want sprayed, I just used painter's tape over it. My favorite spray paint for something like this is Rustoleum's Enamel spray paint. Thanks for stopping by!